3 am, media center parking lot. The parking lot has filled again. 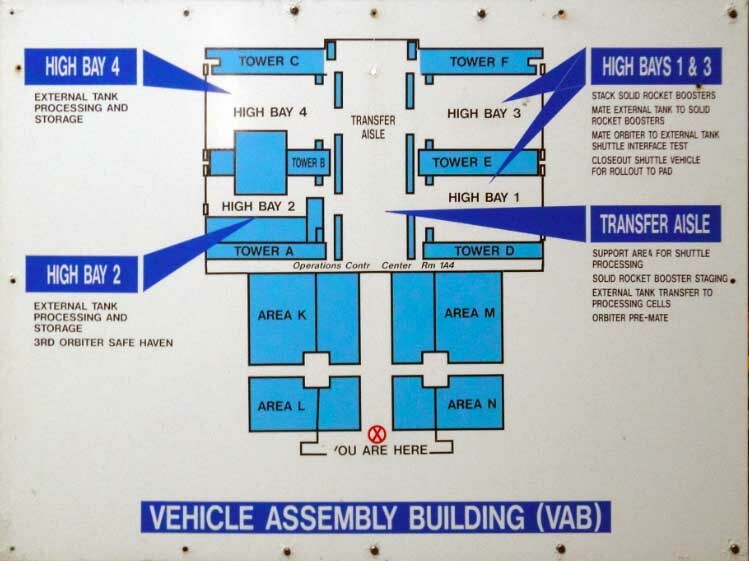 We are parked in the front row and four buses have arrived to take those who wish to go out to the astronaut dormitory. The Astronauts will walk out and onto the van to carry them to the pad at a scheduled 5:11 am. 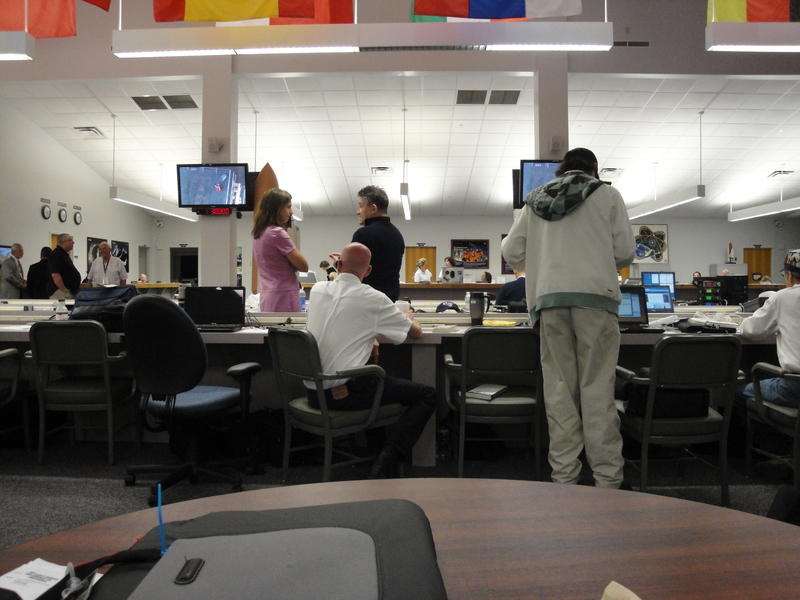 Main Media Center, Kennedy Space Center, 4:29 am, Monday, May 16, 2011. 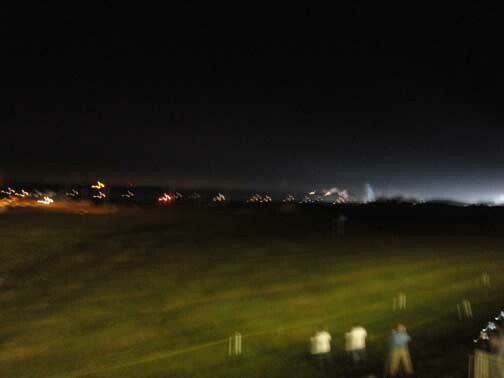 Most think, me too, that a lot fewer media have returned for the second attempt to launch the Endeavour. 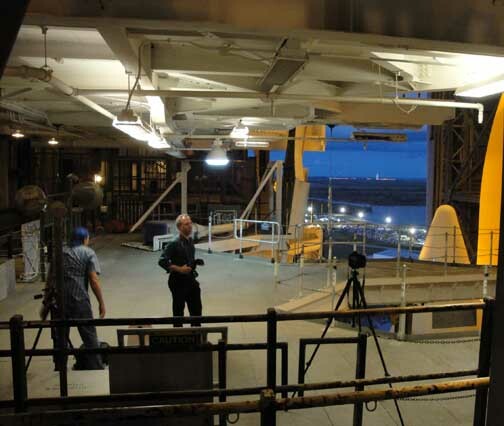 The first attempt on April 29, was scrubbed about three hours before launch because of a faulty switchbox. The arrival of the buses awakes me. It is good news. It means the mission is still on, and that the shuttle has been fueled while I slept. It means the Astronauts are still scheduled to launch this morning. We are on a three hour built-in hold. Actual launch is slightly less than six hours from now. 3:15 am media center. Filling up, but nothing like the April 29 launch. In the parking lot we have met friend and fellow journalist Jim Siegel who reports for the Celebration Independent. He took his chances and left after the RSS yesterday. 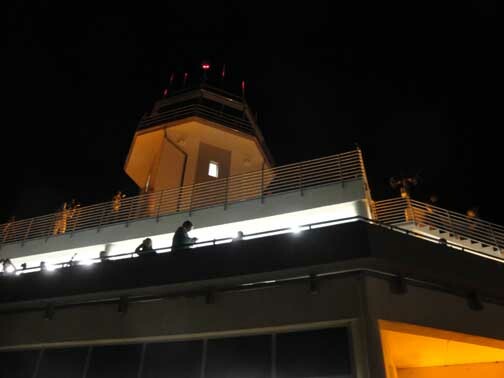 He had no trouble returning to the Cape — little traffic and no line at the security gate. Carol Anne has dithered, but has now decided to go to the Astronaut walkout. Security check is 3:45 am and the buses head out at 4 am. The coffee truck has arrived — we go over to get some coffee. The coffee again has no coffee. NBC and CBS have their own buildings on "the mound" which is the high ground at the back of the media site. ABC these days has a rented mobile home type facility parked in the parking lot at the base of the mound. 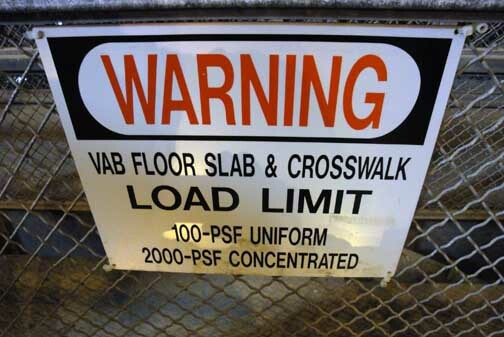 Local TV stations are allowed to park their vans in a reserved part of the parking lot where power and feeds from NASA are piped directly to them. This parking lot was almost full on April 29. When this photograph was taken about 8:30 pm pm May 15, 2011, not so much. ... and yes!, between the trucks the Countdown clock is visible. 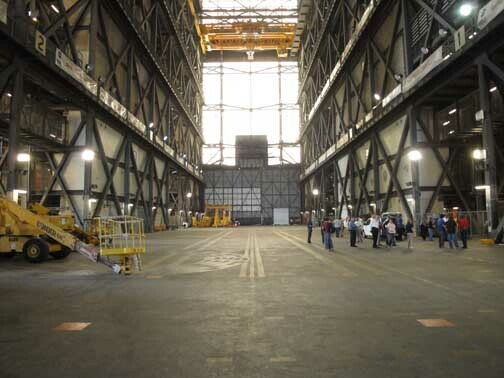 Beyond the clock, not visible, is Pad 39A where the Endeavour was waiting to be launched. 3:30 am media center. I check on the weather. Candrea K. Thomas, public affairs officer, tells me — still a 30-percent chance of weather problems. Only challenges appear to be some crosswinds. I ask her about chances of an aditional tour of several NASA facilities. Cheerfully, she says she’ll start a list “send me an email” and if I’m around on Tuesday, she’ll see what she can do. I immediately send her an email, then walk back over and tell her it has been sent. 3:45 am. The cafeteria. I have debated whether it is worth the five-minute walk across the street to the cafeteria for coffee. I finally give in and head over. This place, too, is empty. Where is everybody? The cafeteria opened at 1 am “but business has been very light” the cashier tells me. 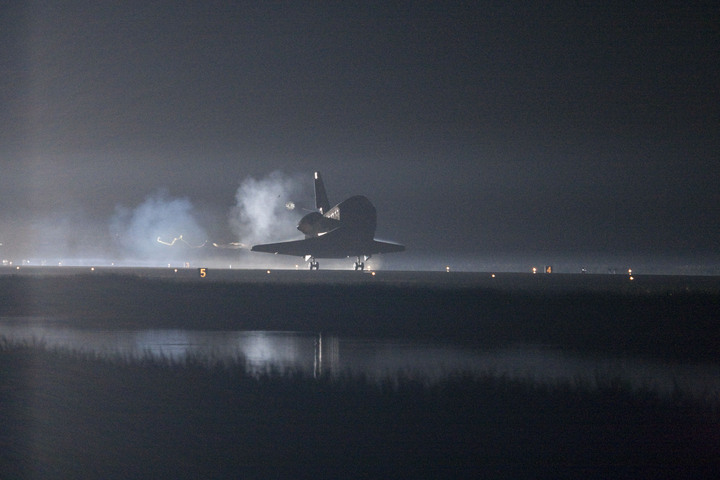 We both agree that many fewer people are returning for the second attempt to launch the Endeavor. Good news — the cafeteria brews Starbucks. I mainline a couple of swigs of coffee as I walk back and, whoa, finally my headlights come fully on and I am awake. The media are all here. 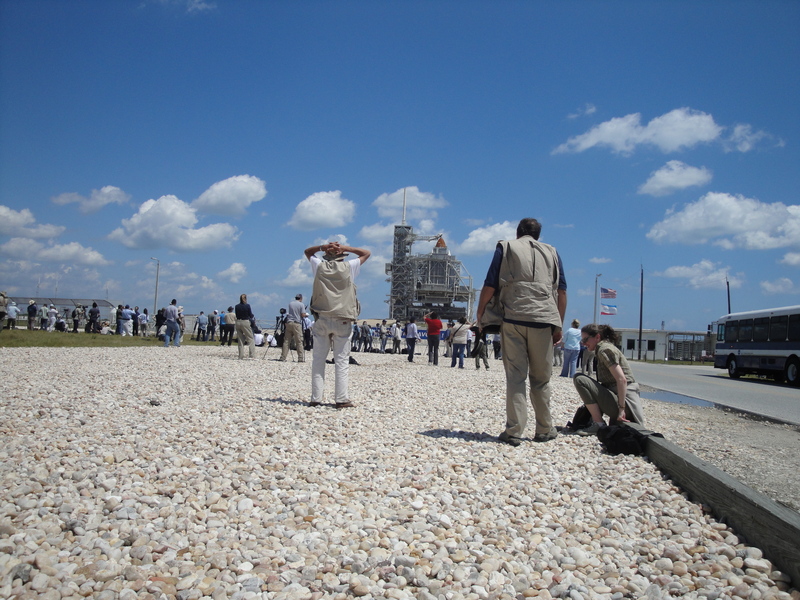 The Astronauts are at the launch site, Pad 39A. It is a chillier than expected dawn. It is 5:45 am at the Cape. 5:45 am media center. Carol Anne has returned from shooting the Astronauts loading onto the van. She has emailed me using her iPhone a half hour earlier that it is freezing out there. She checks through the media cventer and then heads for the car to go back to sleep. She will re-surface in another hour. 6:30 am Tweetup area. 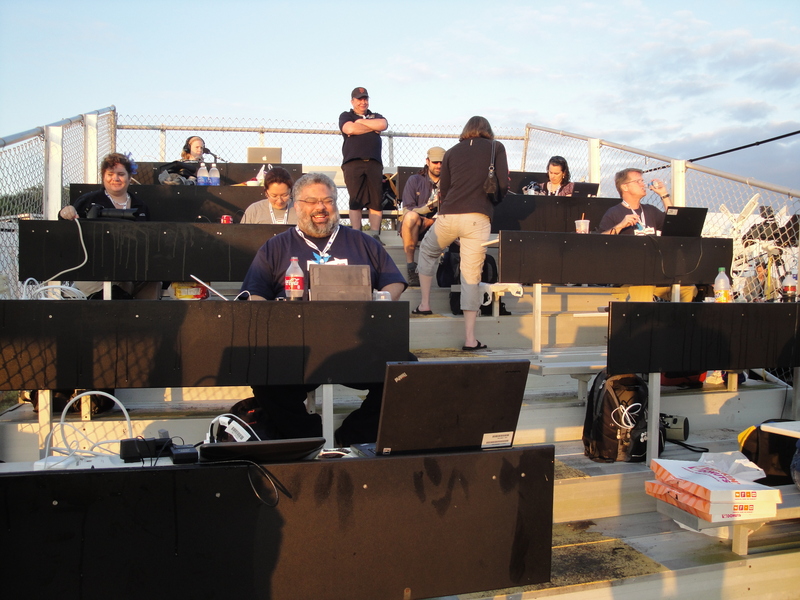 I go looking again for the Tweeters and have finally found them scattered in several bleachers and in chairs. They were allowed in to watch the RSS Sunday morning, and then allowed back into the media center Sunday evening. I find one of the several Tweeters who actually was here before. 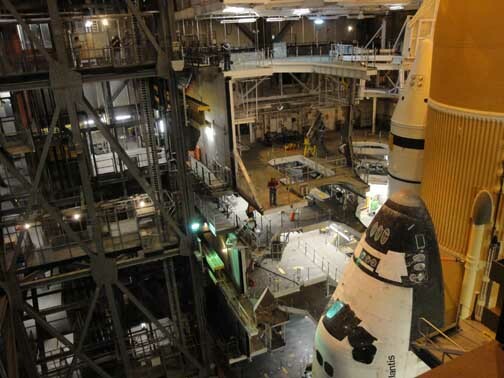 Supposedly, once you have been here, you are now allowed back, but because Tweeters sometimes cancel too late for NASA to replace them, they invite other Tweeters who have already cleared security. The rules that I have been told, and the experience of this second-time Tweeter don’t quite match, but no matter. The enthusiasm of the Tweeters is impossible to undermine. 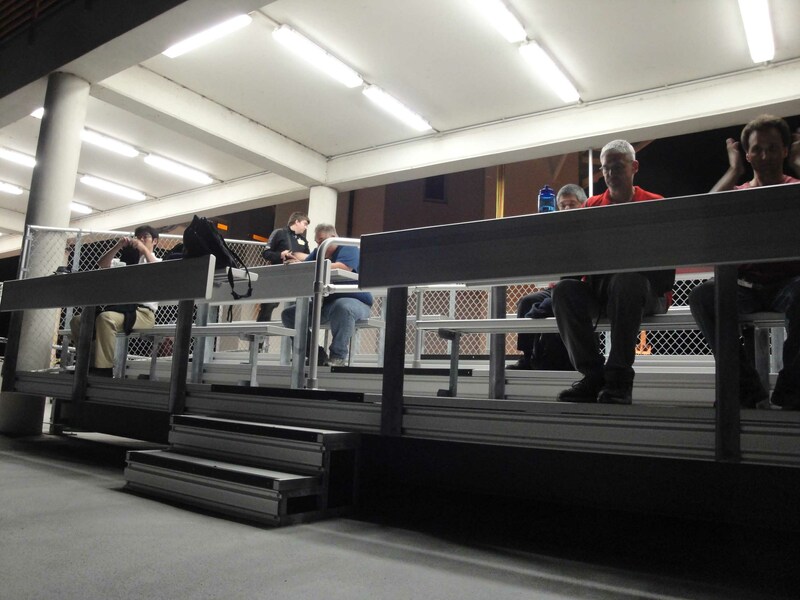 Long before 5am about eighty Tweeters have settled into two sets of bleachers from all over the world. They are of good cheer. Even returning to find their tent, tables, air conditioning and that neat astronaut suit they could climb up into and have their picture taken is gone doesn't seem to phase them. Their tables are gone? Who needs tables? No air conditioning? Who needs it with this kind of weather. Eighty of the original 150 Tweeters here on the scrubbed April 29 launch are back and their good spirits and elan are undiminished. Allowing them to see the RSS Sunday morning was a major hit, and for them an unexpected surprise. 7:40 am media center. Carol Anne has moved to our workspace in the annex after a large round table I staked out earlier in the morning has filled up. Internet in the main media center is sagging, probably due to everybody being on it. 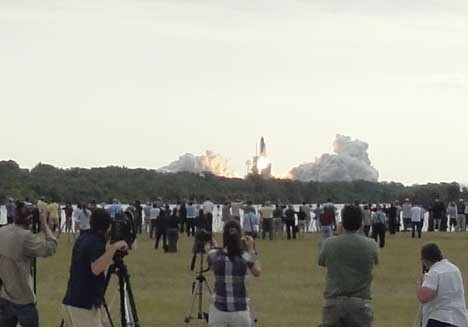 Where you watch the launch really doesn’t much matter — it’s hard to miss when the shuttle launches. We’ve even photographed it from our second story porch in Celebration, FL, forty miles away. 7:44 am media center. 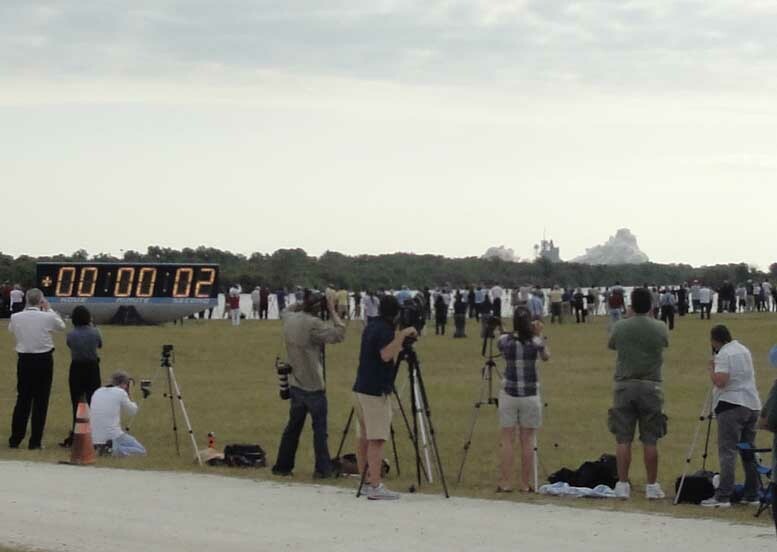 The launch clock reads 21 minutes 39 seconds. To actual launch, with the upcoming built-in holds, launch is now 74 minutes away. Here we go. Following launch, one hour later, is the post-launch press conference, about the time the shuttle will be passing overhead on its first orbit. 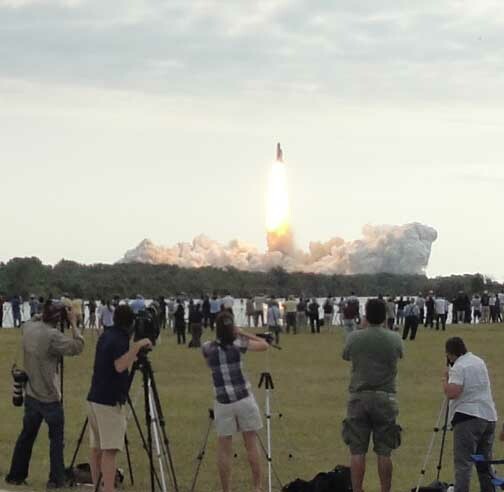 If Endeavour launches this morning, we’ll be back at the Cape before 7 am Tuesday morning for the rollover of the shuttle Atlantis (STS-135) from the orbiter processing facility (OPF = the hangar) to the vehicle assembly building (VAB). This will be the final rollover ever, and the beginning of the final launch in the shuttle program. “petecrow/NASA” © 2011 by / Peter M. Crow and the Peter Michael Crow Trust and by Seine/Harbour® Productions, LLC, Studio City, California. As soon as we pulled off for the obligatory morning picture of the Days-to-Launch sign, cars pulled off and piled up around us. Happy surprise -- we've been hanging and talking with these guys. This is a busy picture. I'm taking a picture of them, including Carol Anne who is taking a picture of them, and the guy on the far right is taking a picture of me. Covering stories like shuttle launches, reporters are easily amused and often have too much time on their hands for stuff like this. This morning we will move to the Cape and remain at the Pad 39 Media Site at Kennedy Space Center until either STS-134 is launched, or until the mission is scrubbed. 8:30 am, Celebration, FL. With Carol Anne in tow, we make the morning provisioning stop at a donut shop across on Highway 192, then head onto the 417 for the Beachline (State 528) and the coast. As expected traffic at this hour on a Sunday morning is nill. 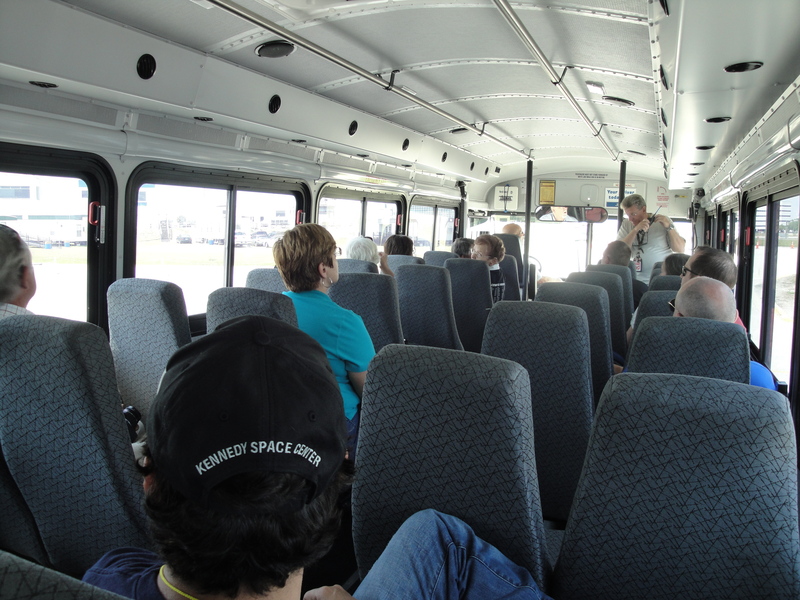 We are on our way to watch the rotating service structure (RSS) be retracted from the shuttle at Pad 39-A. It is scheduled for Noon, and we have to be on the bus and clear of security by 10:30 am. No problem. 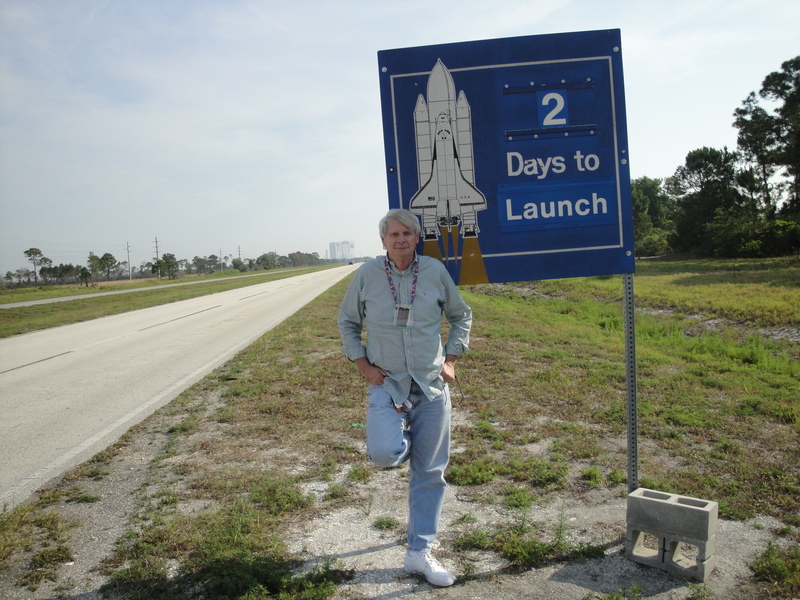 We breeze over to the coast and through the gates onto Kennedy Space Center and arrive early. The day is surprisingly comfortable with a breeze and although the sun is out, humidity is low. I’ve covered this event before, but Carol Anne has not. 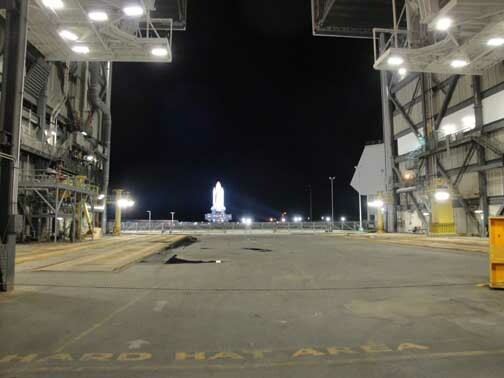 I notice that the media has been moved back from the gate leading up to the launch pad another few yards. It doesn’t matter. If someone is in front of you, as the tripod guys always are, just step back a few feet and you can see the entire pad. It’s not hard to miss. 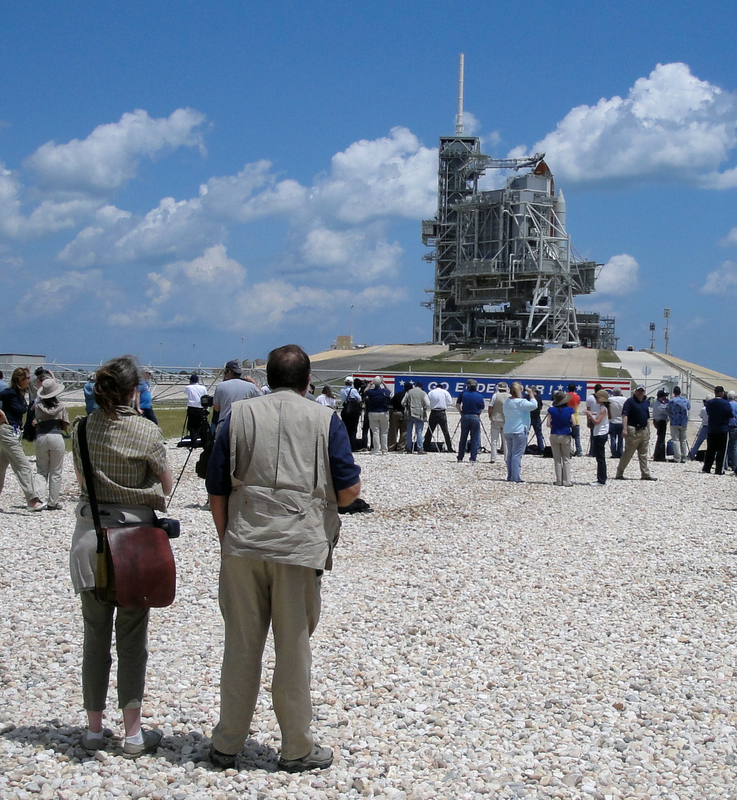 Roughly a quarter to a third of the 1,500 accredited reporters showed up for the trip out to Pad 39-A Sunday morning, May 15, 2011, to watch the rotating service structure (RSS) be retracted from the shuttle. 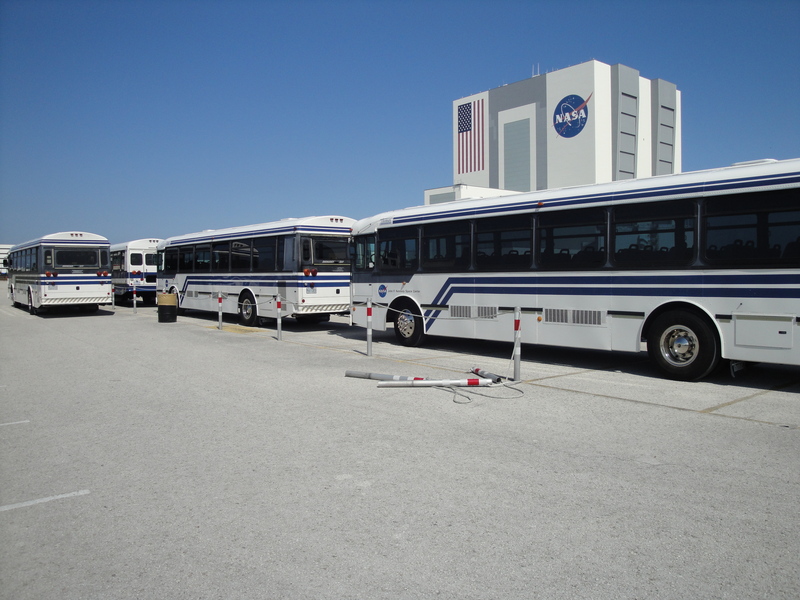 As a result, NASA needed a tons of buses. The rotating service structure (RSS) retraction is shown in a sequence of five pictures -- scroll down. It's the next post following this. 11:50 am, Pad 39-A. Happily, and surprisingly, the rotating service structure (RSS) begins about 10-minutes ahead of schedule and well before 1 pm we are back at the Media Center. To see the Retraction of the rotating service structure (RSS) : scroll down — the retraction is shown in a series of five pictures in the post directly following this post. 1 pm, media center. This place is still empty, and as we left the bus we noticed the parking lot was emptying out. We have a short debate as to whether we should leave KSC and find lunch. It is a short debate. We have so much time that it cannot matter even if we begin to get caught in the growing crowds that will likely be flocking to the Cape later this afternoon and evening. I field a phone call from my cousin. A friend of his, a motion picture director, wants my advice as to where he (the director and his family) should view the launch. The shuttles are brought to the launch pads on Crawlers. The roadbed of the Crawlway is river rock from Alabama and Tennessee. 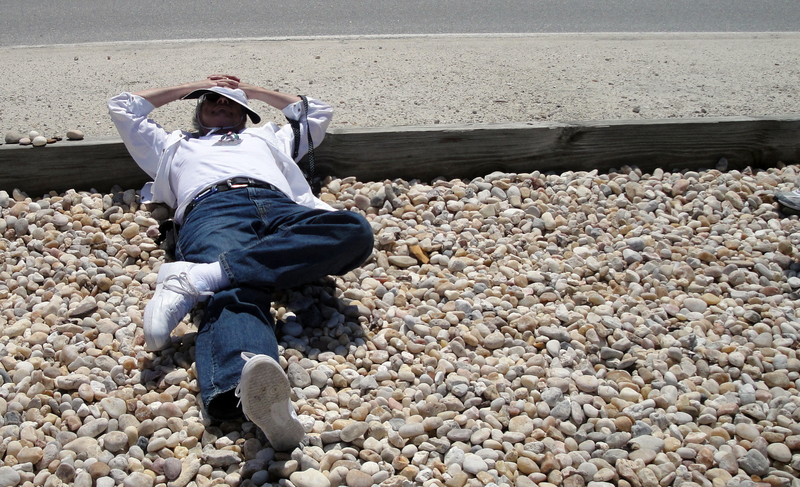 Pete Crow is among the reporters and photographers lying on the Shuttle Crawler near Pad 39 A on Sunday, May 15, 2011, waiting for the RSS to be retracted from Shuttle Eneavour. 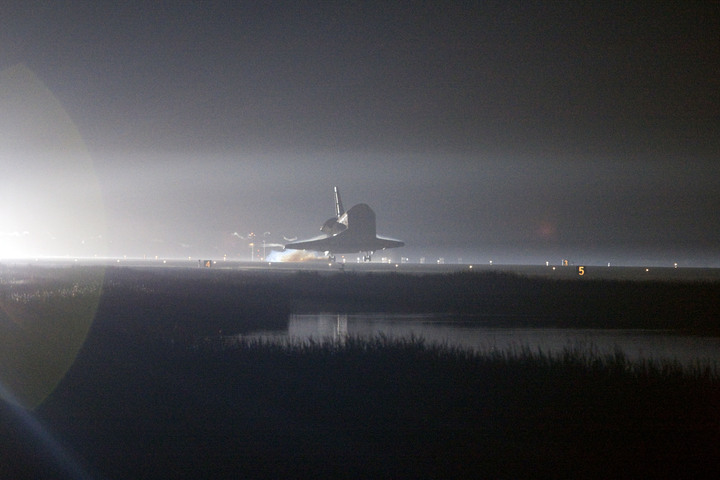 This is the second to last shuttle mission, STS-134. Well, ahem, he probably should have bluffed his way into the VIP section starting weeks ago, but it’s too late now. I am running a link to the public viewing areas that NASA recommends on each of these blog posts because it is often difficult to find the link on the NASA site. I refer them to NASA and that link and am hoping for the best for them. Fact is, in all the launches I’ve seen, I’ve only watched one outside of the press site so I’m a complete pilgrim on where to watch launches around here. 1:30 pm Shuttles Restaurant. 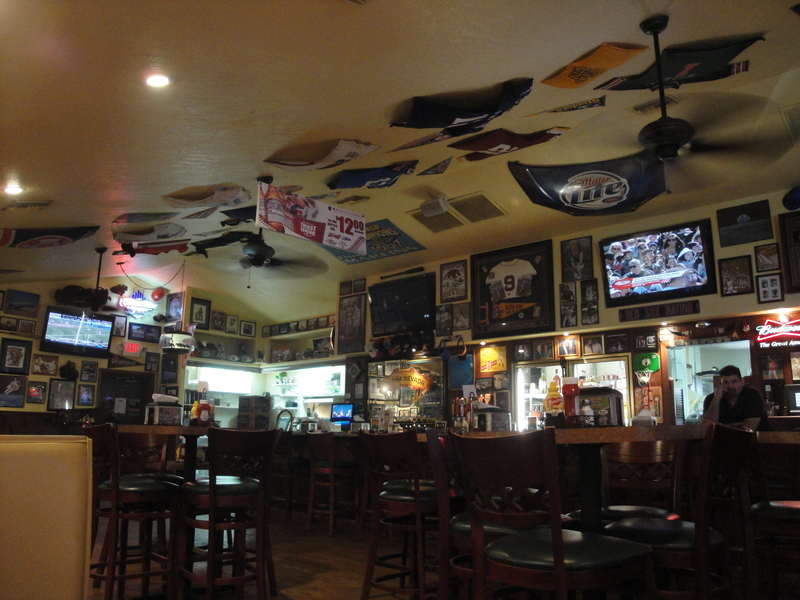 Shuttles is an amiable sports bar south of Kennedy Space Center Gate 2 on State Highway 3. We first found it a few launches ago. It is much closer than retreating all the way to Titusville to the west or going all the way south to Cocoa Beach. The real draw of this place, however, is the great food. Shuttles, a sports bar, on State Road 3 south of the entrance to KSC. Good food, but could it be an endangered species? 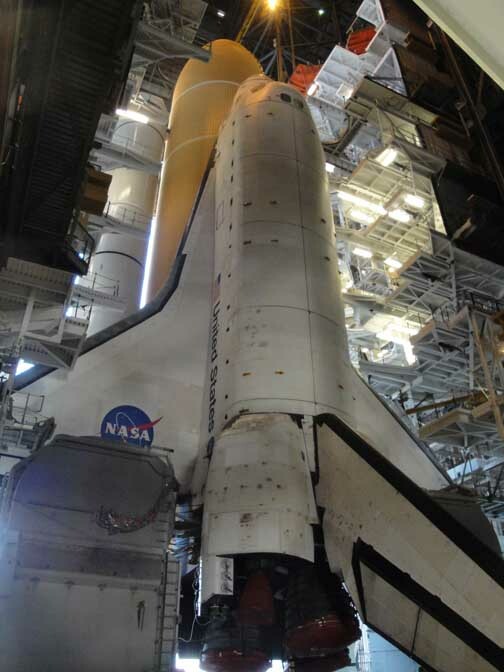 -- with the shuttle program ending, this could put a great restaurant/sports bar under duress unless you drive over and have a bite and a beer every so often. And no, my brother-in-law doesn't own the place. Shuttles, winkwink, is obviously named for the Space Shuttles, but someone around there also seems to be a Boston Red Sox fan. The place is empty. Good for us, but not so good for Shuttles. We are completely mis-gauging the size of the crowds. So far the roads are completely empty. In the end we zip over to Shuttles and back seeing virtually no cars. 3:00 pm Media Center. We ease into the empty media parking lot. We now suspect that the media will filter in beginning early evening. If we’re right, and if the media is coming at all, this is a new age. It used to be that the media would be here . 4:00 pm. Carol Anne is out sleeping in the car and I’m in the completely empty media annex where my work space is. I have checked the adjoining workspaces and now find most are unassigned. On April 29, they were all assigned. Apparently lots of media organizations are not returning. Astronaut Michael Good being interviewed. There's plenty to hate about Astronauts -- they're good-looking, articulate, intelligent and they're the kind of guys who always get the girl. The problem is, however, they're also likable, intelligent and engaging to be around. I encountered Mr. Good briefly as he passed through the annex on his way to interviews on Sunday, May 15, 2011. The lost Astronaut. A guy in a blue jump suit has wandered into the annex and is drfiting around looking lost. He hwinds up at the back tables behind me reading names of organizations taped to the tables. He is astronaut Michael T. Good who he flew on two shuttle missions and now lives in Colorado. Check his entire NASA bio out HERE .It’s worth reading. I’ve interviewed Astronauts over the years. It is hard not to be holy-freaking-cow about Astronauts — about where they have been, about how superbly trained they are, about how just plain gutsy it is to climb the shuttle and be launched at many times the force of gravity into space, and lots more. I’m standing here face-to-face with a guy who has logged seven minutes shy of 30 hours of walking in space, and flown two shuttle missions (May 2009, STS-125, and May 2010, STS-132). With Astronauts, and with anyone you’re interviewing, the thrust of any story is always “tell me about it”. But with Astronauts? — how can they ever really tell you about it? I go back and introduce myself to Astronaut Good. I ask him if interviews with Astronauts that NASA is offering are one-on-one or in crowds. He says he has no idea, and in fact says he is lost, adding he is rarely if ever has been to the media site. We walk over to the main media site and we chat along the way. In the main media center he is quickly oriented, finds his NASA handler and heads for his scheduled interviews. 10 pm, media site. Gorgeous night at the Cape. Gentle wind, nearly full moon, humidity is low. Carol Anne and I walk the site, still looking for the Tweeters. Of the 150, only 80 will return. NASA polled them to see who wanted to come back a second time. Only half were able to do so. 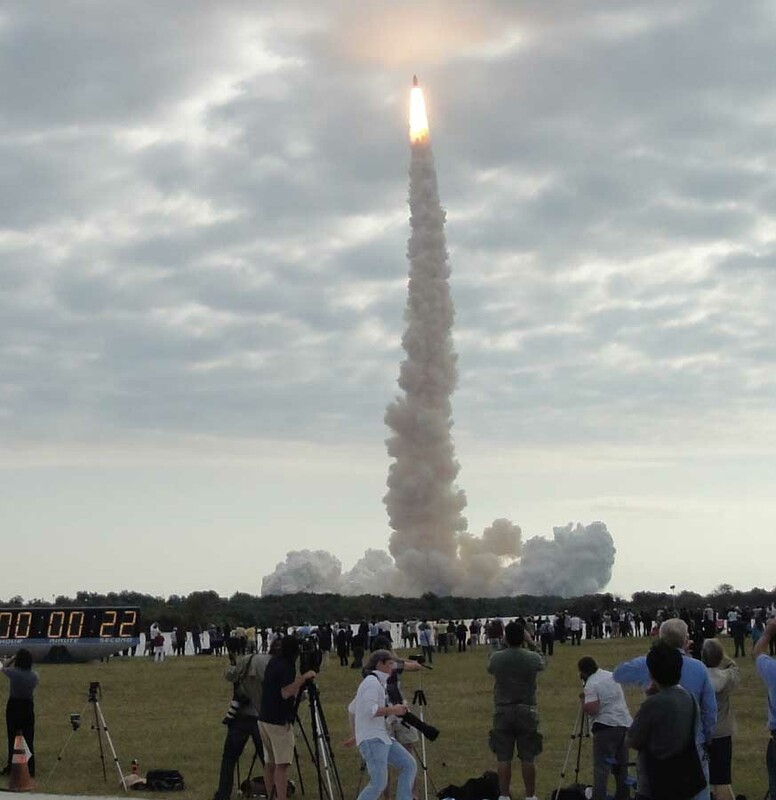 Tweeters pay their own way; last time the April 29 launch was on a Friday. Back at the media center, I move my stuff from the annex to an open table in the back of the main media center. Only three NASA personnel are working the site, including an affable PR woman from Marshall Space Flight in Huntsville, AL. We chat. It has been years since I have been in Huntsville, but in the 1950s my brother-in-law worked as a very junior memberon Wernher von Braun‘s engineering team there at Redstone Arsenal, and another brother-in-law’s family owned the Coca-Cola bottling company there and a lot of the downtown. My eldest niece was even born there. A long time ago. The town has grown. Media too seem to be missing in action. From my past experiences of being buried in traffic, I may have over-reacted to the number of people who would be flowing out to the Cape to watch the launch. I’m weary and head for the car to sleep. 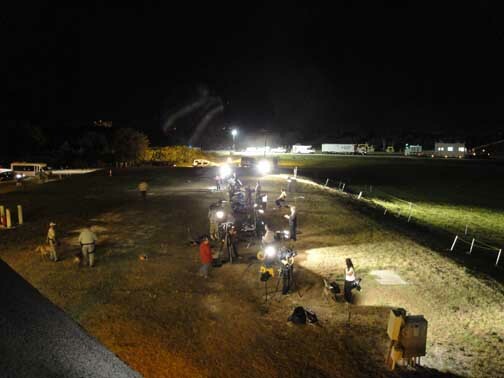 Before I go I see that the media is being invited to watch the launch from Banana Creek, the VIP site. I sign up, but before I go I’ll check and try to learn more about it. A decision on whether to fuel will be made at 11 pm. and if the go is given, the tanks will be filled shortly before 3 am. I’ll be asleep long before either event. … and to to bed. 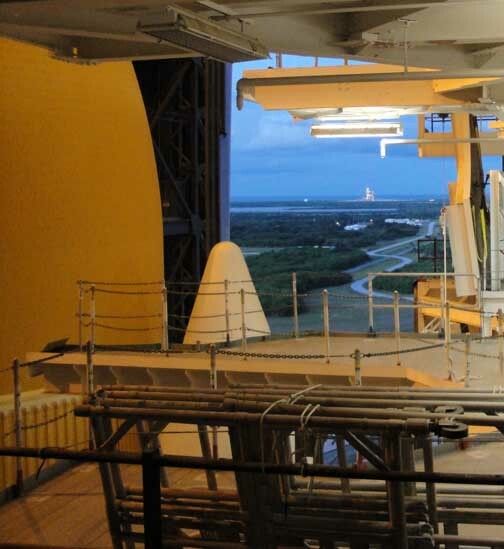 Launch Pad 39-A shortly before rotating service structure (RSS) retraction began. 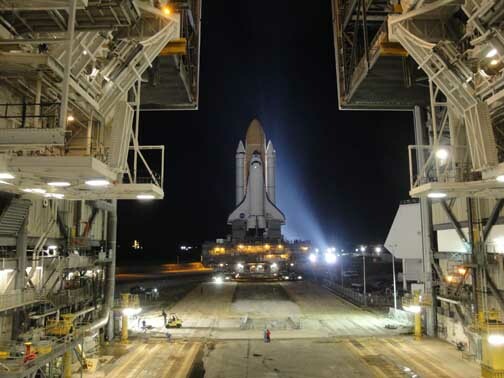 This series of photographs shows the retraction of the rotating service structure (RSS) that keeps the shuttle safe on the launching pad which must be retracted in the hours before launch. 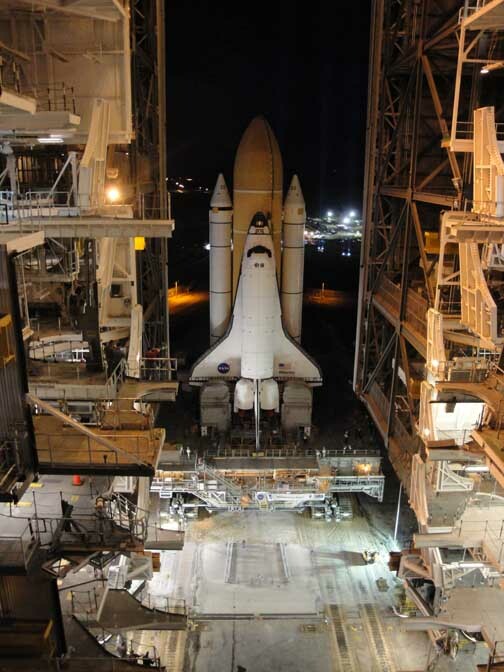 The retraction of the rotating service structure (RSS) from the shuttle Endeavor was scheduled for Noon EDT, Sunday, May 15, 2011. In fact, it began a few minutes early. Retraction takes about 45 minutes. The next major step for the launch is fueling. 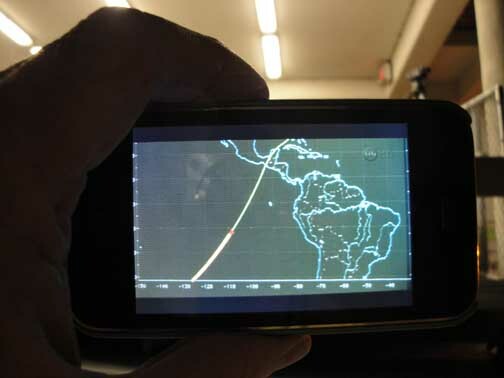 This is scheduled to begin at 11:36 pm, May 16, 2011, roughly twelve hours after the RSS has been retracted. The Astronauts will be brought to the launch pad starting about 4 am. If all goes well Endeavour will lift off Pad 39-A at 8:56 am, Monday, May 16, 2011, on her way to the International Space Station. 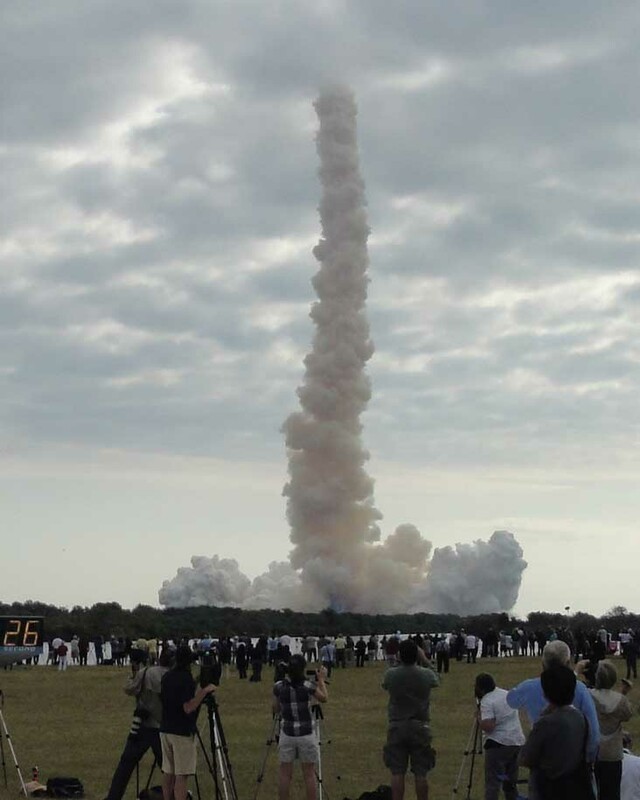 This is the final launch of the Endeavour, the newest member of the shuttle fleet. 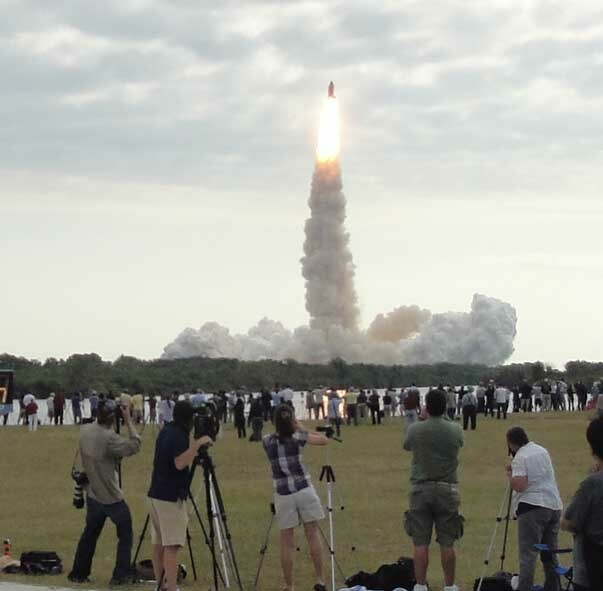 Mission STS-134 is the second to last shuttle mission. 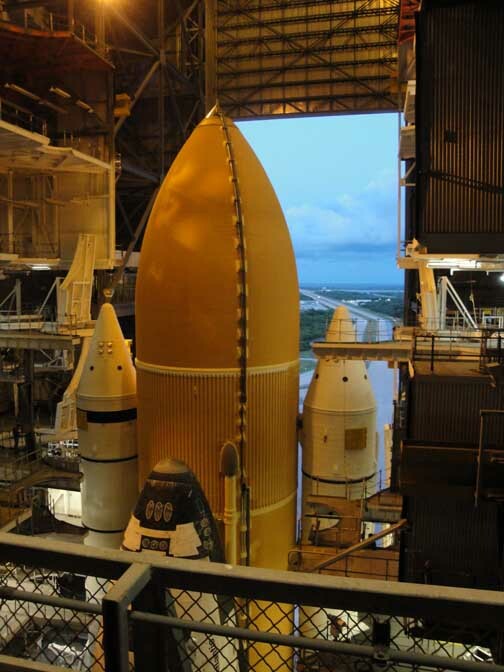 Launch Pad 39-A shortly before retraction of the rotating service structure (RSS) began. 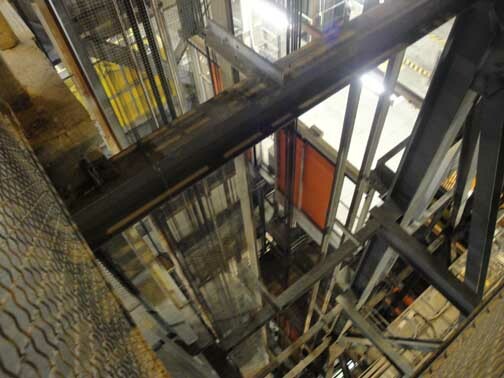 Retraction of rotating service structure (RSS) complete. Ready to go fly. Retraction was completed about 20-minutes ahead of schedule. 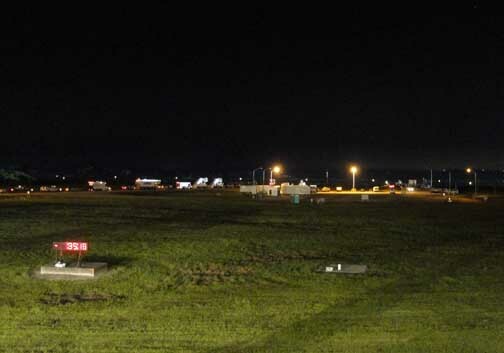 With actual launch 21 hours away, weather remained unchanged with only a 30-percent chance of unfavorable weather scrubbing the flight. My photographer is back so today I get my picture taken in front of the sign. If I had not held the camera sideways, I would have used her picture instead. The Cape, 8:10 am. I call the media center to confirm the day’s events. The countdown clock is running now, but not much is scheduled . At noon there will be a drive-around for the media, much like the visitor’s center seems to conduct for tourists. 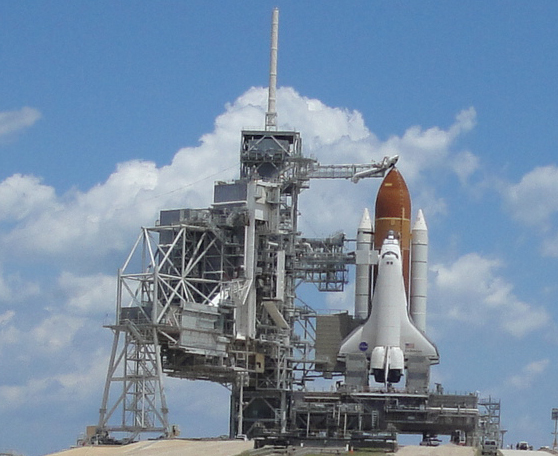 Apparently it will include a drive-by launch pad 39-A where the Endeavour wil be launched, and around the rest of the complex. It’s not clear where the bus will go, but I am later told that “we’ll drive around until everybody gets tired”. Nobody gets off the bus. Nobody quite knows how long the event will last. I sign up along with Carol Anne, who is accredited as my photographer. We are the number one and two people on the list. Looks like they won’t need a big bus. The countdown clock is running. 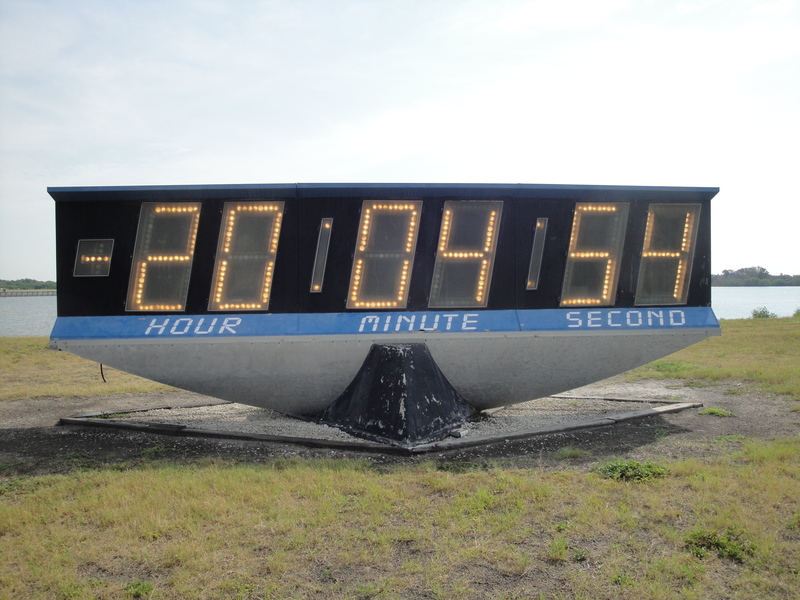 Because of multiple planned holds, the clock does not reflect the actual time to the launch which is still about 46 hours away. Instead it reflects the time to launch without the built-in delays. Confused yet? 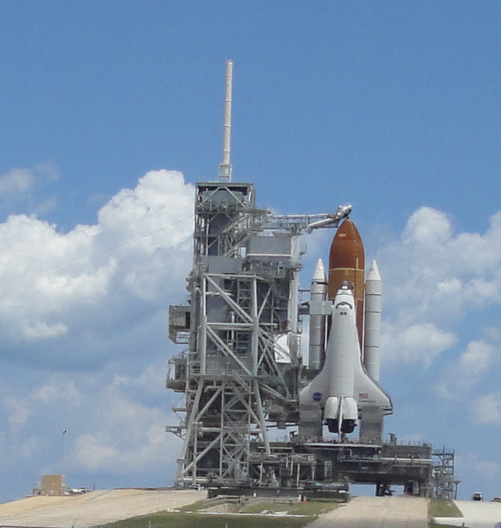 The shuttle is scheduled to launch at 8:56 am Monday morning. The New Zealand guy. I’ve been camping in the main media center because it is mostly empty and somewhat more convenient than my work space in the annex. Moeover, the annex is empty and vaguely lonely. Besides a couple of guys who sit in the back and mumble, nobody except a guy with a clipboard has shown up over there for days. The Clipboard guy was inventorying the stuff in the annex making sure no one has carted anything off. He actually knocked on the door before entering giving anyone who was stealing anything an extra moment to stuff stolen items in their pants. The New Zealand guy was leaning against the work space I was using in the main media building. Since it was not mine, I assumed it was his. But no. He was just leaning. We struck up a conversation. CLICK TO ENLARGE == This commemoration sign was for many years on the grandstand which was destroyed in the hurricanes in 2004. 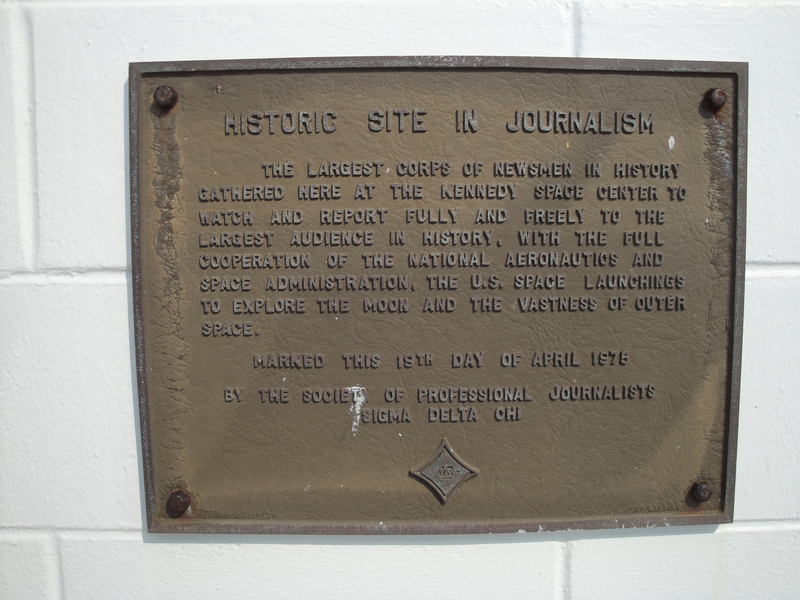 It is now affixed to a building adjacent who where the grandstand was. No, my experience was that the Tasman Sea could be very unfriendly. I asked him if he had covered launches before. Like many reporters that are here, he had not. Also like most accredited media, he has paid his own way from New Zealand. The problem for him is, as it is for most journalists who come a long distance, that once a shuttle launch is delayed, they are marooned. It is too expensive to go back home and return, but there is little for them to do except to run through their money. That has happened to the NZ guy who is desparate for the launch to go on Monday. Can he stay another few days and see the prep begin for the final launch? Alas, he is broke — he must leave on Monday, launch or no launch. 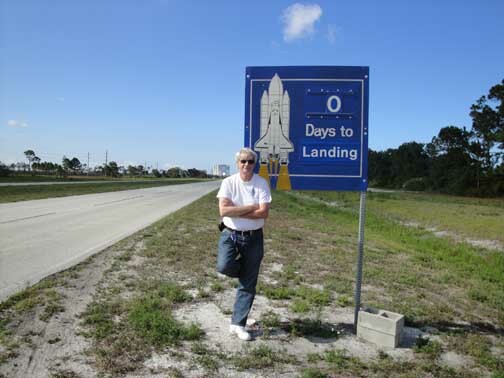 He cannot even stay one more day and see the final rollover of the shuttle Atlantis? 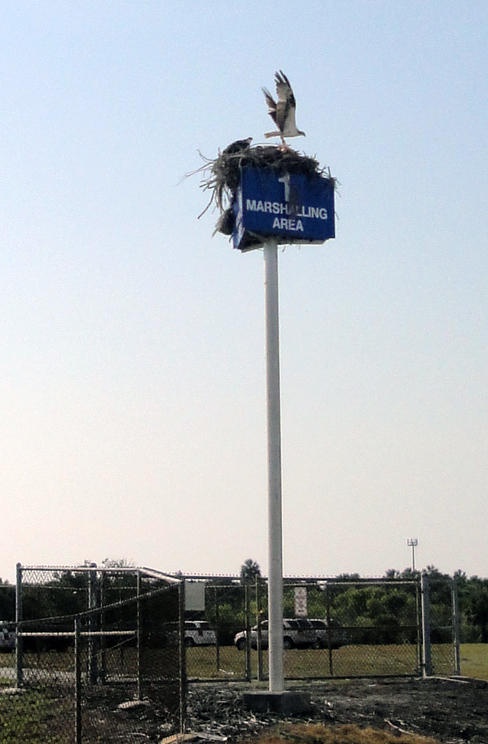 Birds have set up shop on the top of a lightpost in the media parking lot. They'll have a better view of the launch than even the President of the United States, if Mr. Obama shows up again for Monday's second attempt. Later I discuss him with Carol Anne and we decide that if I can find him, we’ll take him home and feed and house him, if he wants. He’s spending $1,000 a week for just hotels and is tapped out. 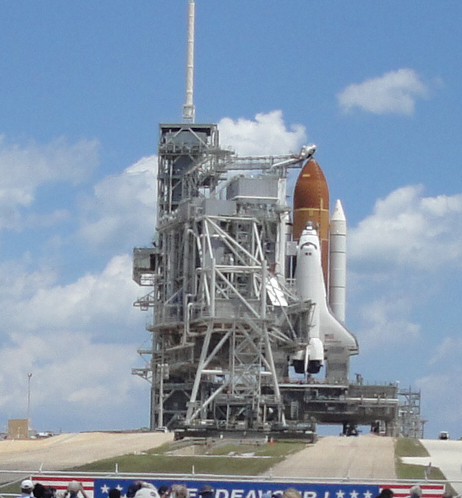 The first stop is Pad 39-A and we circle the pad where the Endeavour sits, ready to go. On the way out to the pad we pass one of the Crawlers. 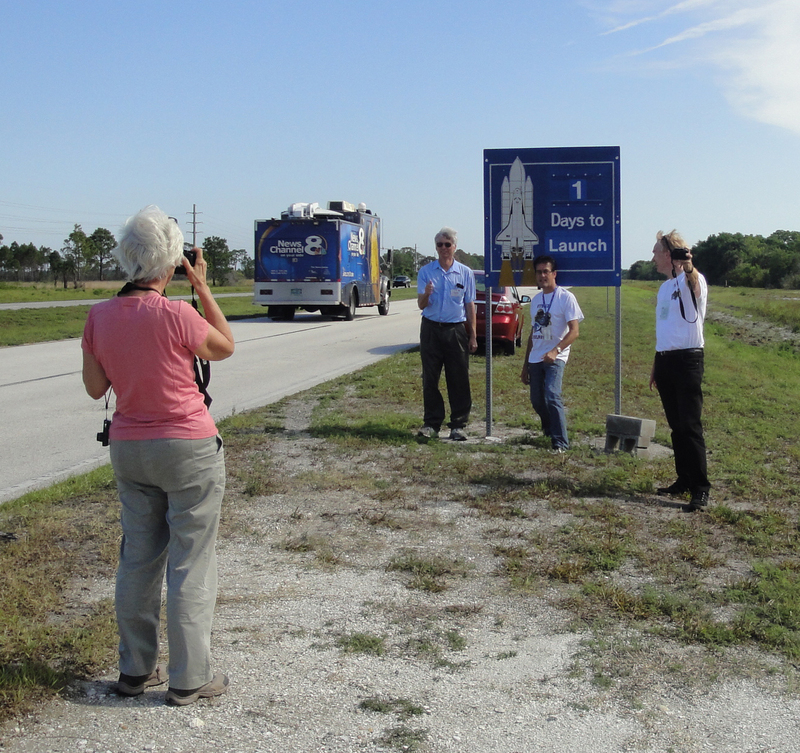 Then we circle on a road on the ocean side of KSC and briefly pass the old abandoned US Highway 1A1 which heads northward, north of Pad39-A. In a few moments we circle south of Pad 39-B which, like 39-A was both a shuttle and an Apollo launch pad. 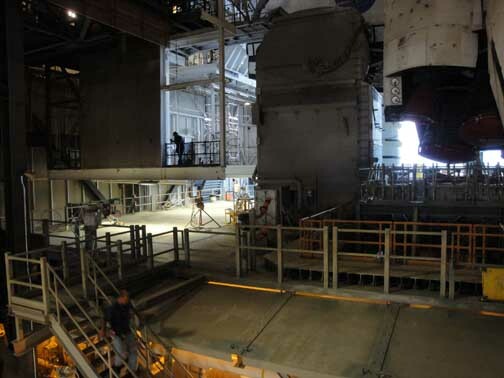 Pad 39-B is being torn down. A couple of weeks ago we visited this pad and shot pictures of it. Now we can see how the teardown is progressing. The noon tour of KSC facilities resulted in a surprise. All except one on the press bus have seen everything before and were joy-riding. The surprised NASA guide cheerfully hauled the press off anyway regaling with them with rarely told tales including the fates of the Columbia and Challenger shuttles, both of which were lost. 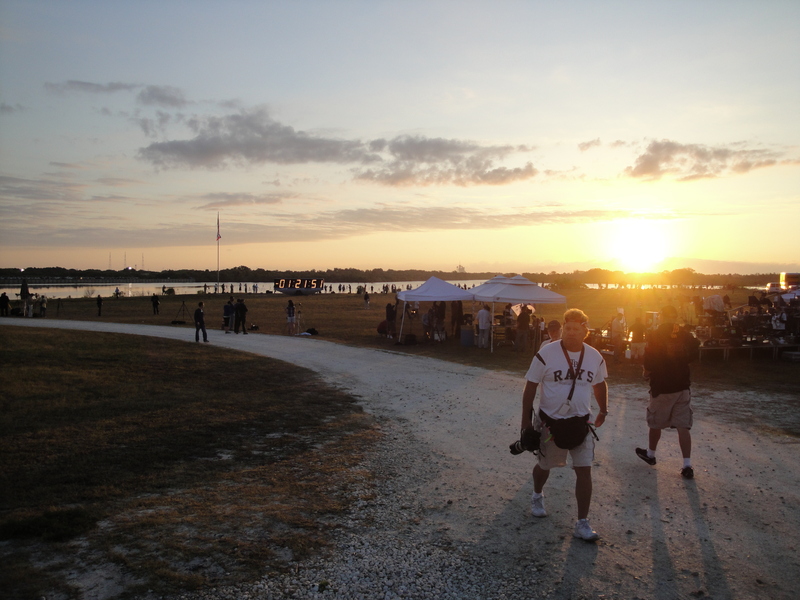 We visit the shuttle landing facility (the runway) and then circle through the Banana Creek Viewing site. Whoa. 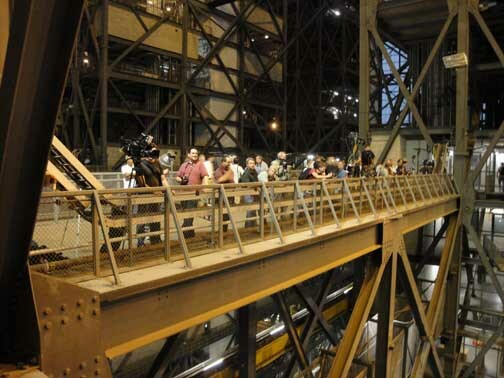 This is way off limits usually — this is where the VIPs watch the launches and where the press never sets foot. IO study the view. Actually, I think the press site is better, but I figure I better keep that to myself. The VIPs might grab the press site, and the media then would find itself up Banana Creek. The Challenger and the Columbia. In the entire program NASA lost only two crews — a remarkable achievement in a program as dangerous as this. On the bus our guide drifts into a discussion of where the lost shuttles are. This is not a topic often discussed, nor a question often asked — and, indeed, the question is not being asked today. 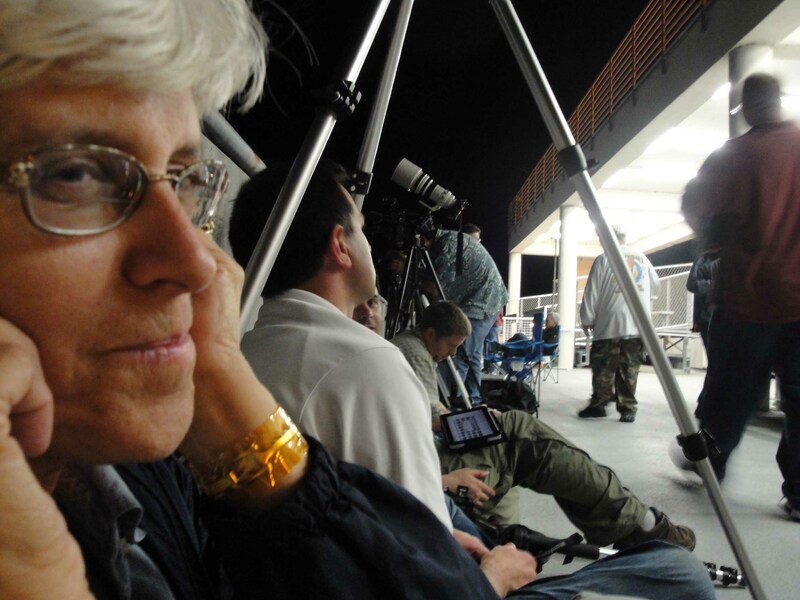 It’s a painful subject not merely for the NASA personnel who knew the lost crews, but for the media, who almost universally loves the space program and NASA. But today the guide is volunteering information on the lost shuttles. 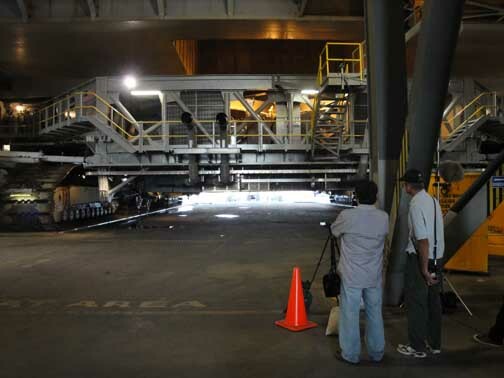 The remains of the Shuttle Columbia are, he tells us, stored in boxes in the Vehicle Assembly Building. Perhaps on the fourth and fifth floors of Tower A. Perhaps on the 16th floor. 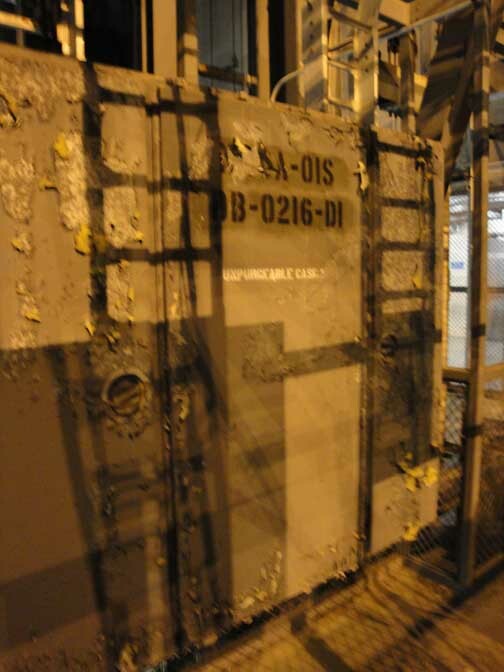 More pieces of this lost shuttle are being found in Texas all the time, we are told, and more therefore are coming to KSC for storage. Supposedly, these pieces are from time to time used for research. The remains of the Shuttle Challenger were placed in a silo also at KSC, near or on the air force station, our guide continued. He said it is believed that the salt air of the oceans has thorough denegrated the pieces of the Challenger that were recovered from the ocean, and that nothing remains of the Challenger today. Clarificiations — schedules are firming up. I sign up for the retraction of the arm at 39-A on Sunday morning as soon as the opportunity is offered. This is one of the last major steps in launch prep prior to fueling and will take place about Noon Sunday, roughly 21 hours before launch. I’ll photograph it, and Carol Anne will get it from another angle with different equipment. Three astronauts will be available for interviews on Sunday and Monday. I dither. The schedule sheets quickly fill up. No astronaut interviews for us this time. Moving to the Cape. When we leave Orlando Sunday morning it is unclear when we will return. After covering the retraction of the arm at 39-A Sunday afternoon, it would make no sense to leave the Cape. By late afternoon Sunday roughly 500,000 people will be pouring into the area around the Cape. If we leave Kennedy Space Center the roads to return to KSC will be jammed. I will stay and camp overnight Sunday night here. 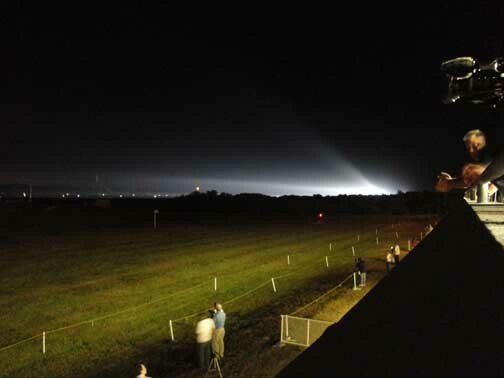 I will not be alone — there likely will be upwards to 1,800 people overnighting at Press Site 39. Happily, NASA has anticipated the needs of the 1,500 expected media, plus those 150 Tweeters who by then will be back. The NASA cafeteria will open at 1 am Monday morning. The coffee and mobile canteen will arrive at the press site at 3 am Monday. The press media office will open on Sunday morning at 6 am, and will not close until late Monday night. Bring blankets, food, gameboys, ipods and whatever else along because if you’re the media, you’re going to be out on this sandy strip of beach for a long while — a minimum of 24 hours and maybe longer. I live for stuff like this. 4 pm briefing.The Cape is being pounded by a driving rain storm as the 4 pm briefing begins; hail which is threatened will not appear. The cause of the problem that forced the April 29 abort has been found. A switch box which was supposed to be off when the shuttle returned from space last June was off — but it was off for the wrong reason. It had a short, and only in the last hours before launch of April 29 when the box was supposed to turn on was the problem discovered. Weather has gotten dicey if the launch is postponed from Monday to Tuesday, but Wednesday weather has actually improved. Later next week? The pits. Other questions are answered, but bottom line is, with a half-and-a-half to go to launch, all is still looking good. …. 2038pm this post remains a worksinprogress for now.